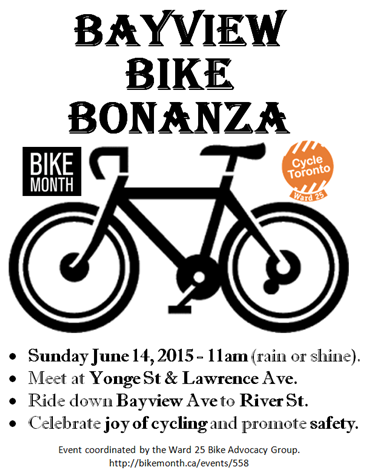 Bike Month 2015 will host many events and activities, including the first ever group ride along Bayview. 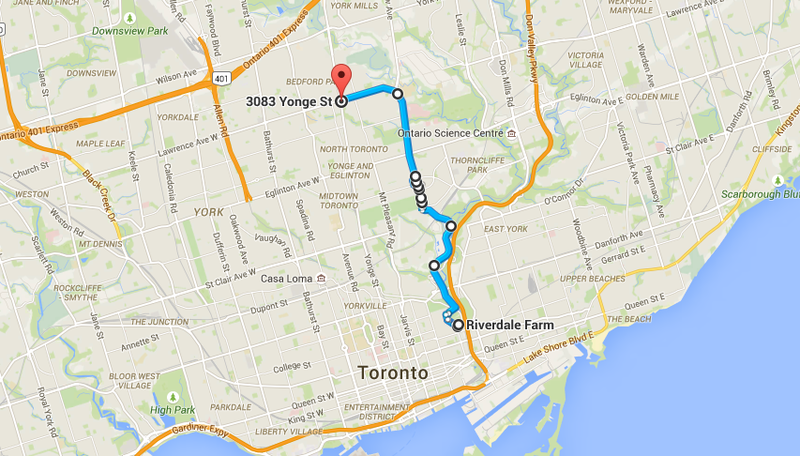 You are invited to the first ever group ride along Bayview, from Lawrence to River, ending at Riverdale Farm. Join the group at 11:00 a.m. on Sunday, June 14, and ride from Yonge along Lawrence, past Glendon Campus, and ride south to the Don Valley. The ride is to celebrate the joy of cycling, to promote the visibility of cycling in this area of the city, and to highlight safety and accessibility concerns along the way. The group will stop at the Evergreen Brick Works Farmer's Market, where they will be hosting Family Bike Celebration (which we will be promoting here on the dandyBLOG soon), and then continuing on to River Street and to the Riverdale Farm. The ride is organized in part by Sunnybrook nurse Christopher Owens who is also the coordinator for the Sunnybrook Bicycle User Group (BUG) which boasts over 300 members! Many cyclists who work at Sunnybrook and go to school at York would definitely make good use of a bike lane on Bayview -- as would the many people who enjoy the events and natural environment at the Brick Works. As Owens says: "I work at Sunnybrook Hospital full-time, and for the hundreds who commute by bicycle to the campus, as well as Glendon, a protected cycle lane along Bayview would really improve safety for all road users and improve local businesses." Cyclists living and working in Ward 25 come on out and join the fun. More information about this ride can be found here. Bike to School Week Begins!